At the end of the day I always take my laptop with me as I never know when I’ll get a call about server issues. So my PowerShell sessions remain open all of the time, with all of the modules loaded. Granted I do save my scripts that I work on frequently, and I had a problem before losing a few scripts without having a recent save. So I got a surprised with the results from a cmdlet that I used frequently didn’t have the desired information. I was trying to get the datastores for a VM Cluster so we can make some modifications to them. When I got this error message (image above), I was just in shock, and this is just not making any sense to me. How could this not return the typical results. So I double check the spelling as stated in the error. I make sure that I’m connected to the vCenter, and the PowerCLI module is loaded. Once I ran the command to check the loaded modules, only then did i see the issue. So as seen in the image above, I can see that I have the required PowerCLI modules loaded, but I also have the FailoverClusters module loaded as well. So I then pulled the list of commands from the FailoverCluster module. 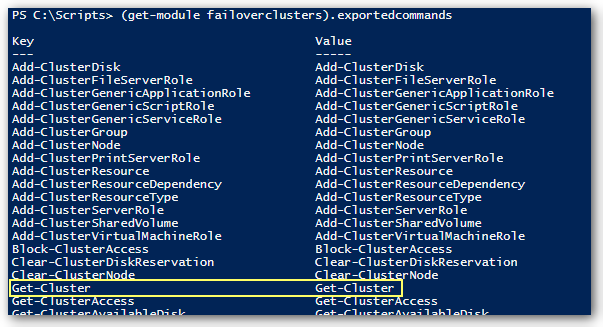 The FailoverClusters module has the command, Get-Cluster, that is also in the PowerCLI module. So when I used the command, Get-Cluster, I expected to see information about the VMware Cluster, but instead I got the error about misspelling of the cluster name. This was a simple fix once I was able to find the issue. Simply unload the module that I was no longer using. I even tried to reload the VMware module and it still didn’t recognizanced the VMware cmdlet, only the failover cluster one. So if loading modules for a single time use, make sure to unload or restart the PowerShell session afterwards to prevent unnecessary issues. It seems that you were exactly in the scenario of “MODULES AND NAME CONFLICTS” in the “about_Modules” documentation.